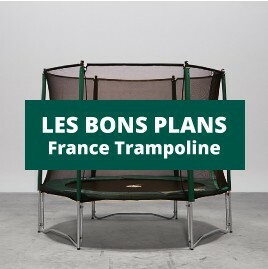 For tourist sites using a battery of trampolines, France Trampoline runs an incredible after-sales service for its products and also for products from other brands. Trampolines placed in tourist sites are in regular use during the day. It is therefore essential to check them regularly to avoid any problems. You are responsable for your equipment and you must not forget that the principal users will be children. As soon as you notice deterioration, you must not hesitate to change the damaged component. We have all the spare parts you could need. They are available in different sizes depending on your needs. Jumping pads are also available, even if your old jumping pad was made to measure. Hot-dip galvanised steel springs, that are rust resistant, are available in many different sizes. If your frame pad is damaged, it will no longer be as shock absorbant. Replace it quickly. Your enclosure should also always be in impeccable conditions to ensure user safety. France Trampoline has been providing leisure professionals with trampoline batteries since 1971, allowing us to privide a wide range of spare parts for not only our own but also other trampoline brands. Trampolines installed in touristic establishments and leisure parks receive a large number of users through out the day. It is therefore important to regularly check your equipment. You are solely responsable for the state of your equipment dedicated to children and teenagers. We can provide all the spare parts you may need, regardless of the size of your equipment. Spare jumping mats are available, even if your old mat was made to measure. Hot-dip galvanized steel springs for rust resistance, available in all sizes. Manufacturing of made to measure frame pads and of standard frame pads. Replace your enclosure, to ensure user safety. Custom spare partsThere are 25 products. Change the jumping mat on your professional 265 x 265 trampoline. 10mm wide flexible PVC pipe for trampoline jumping mats. Sold by the meter.